Well I have a full update for everyone wondering about our laundry room project. We have 3 coats of mud and tape on and Jon will sand it all down tonight and apply the 4th and final coat. Then we will roll up our sleeves and attempt to do something we have never done ourselves before....texturing. My brother has the gun and equipment to do it and we bought the texture so we will see what happens. Jon also talked to some guys at work and they told us to mix a coat of primer in with the texture so we will be doing 2 things at once. Then I will be ready to paint on Saturday, YEAH!! Oh but that is not it, we will then attempt to lay down tile on the floor and hopefully Sunday move the washer and dryer back in. The final step of the whole project will be the ceiling, we are doing a drop ceiling because of all the wires we may eventually need to get to and Jon put a drop ceiling in our last laundry room and it looked great. So we are on the home stretch with just a few more days to go, I am so excited for the finished look and I will definatly post some pictures. If anyone has FREE time this weekend go ahead and stop by we will put you to work!! Well today I thought it was time to change things up a bit and get ready for the Valentine's excitement. At work our shipment of Valentine's items arrived today so it got me in the mood so I thought what better then to update my blog. Isn't funny what businesses go through for one silly day. Just for my Java City I ordered special coffee, rose flavored syrup for our drink of the month and tons of Valentine's candy. Then for Medary we make special cupcakes, cookies and desserts. And to top it all off I prepare a Valentine's Meal for all the students! This year I am not sure what will be on the menu but last year I did a sweetheart meal with Jumbo Shrimp and Prime Rib.....any suggestions?? Another thing that cracks me up is how the flower shops double all their prices. One particular flower shop in Brookings charges $75 for a dozen roses on Valentine's Day and then on a ordinary day they are around $35. That is just craziness!! Here is the February drink of the month "The Rose Mocha"
Well after this past weekend of cleaning out the garage I found some boxes I had been looking for. One of them was from Trevor's room and it had all of his beany babies in it. Every time Dennis and Diane go on a trip to a different city or state they get Trevor a beany baby with the city name on it. So far he has collected 6 of them and that is pretty good for 2.5 years old. Dennis and Diane just need to go on vacation more!! So here is a picture of the shelf's I put up last night in Trevor's room with the bears on display along with a few other items for fun. After I was all done Trevor walked into his room and saw the wall and said "mom what did you build?" "Take those bears down they are mine, grandma Diney gave them to me, Trevor." I just laughed and told him to settle down and that they were on display in his room for a reason. Me: Trevor it is time for bed so we have to shut Chicken Little off, okay?? Trevor: Mom, I love you but go away you are driving me nuts!!! Where does a 2 year old come up with these things?? I just tried my hardest not to laugh but I could not do it I just lost it, well then he thought he was funny. Well we had another successful weekend at the Healy home. Saturday Trevor spent the day with grandma Diane and grandpa Dennis so Jon and I could do some work in the basement. Jon got all the walls up, sheet rocked and 1 coat of tape and mud on. Wow that is good if you ask me!! Saturday we took a break and went to Nick's Hamburgers and my grandma and grandpa where there and they bought us lunch.....thank you!! Then we spent the rest of the weekend cleaning out the garage since it was so nice out. We have an attic in our garage so Jon got some boards to lay down up there so we could use it for storage and I helped him haul up the Christmas tree, Christmas decor and tons of hunting stuff. I was so excited to get all of this done because it has been on your list since we have moved in. Trevor was also busy helping us and playing in the snow!! This first picture is of Trevor on Sunday afternoon watching Chicken Little he feel asleep, I guess grandma and grandpa Healy really wore him out!! These next 3 pictures are of our laundry room, we have decided to make a closet in there for more storage so it makes the room look smaller but who needs a huge laundry room?? The pedestal below the window is for the washer and dryer and Jon will tile that to match the floor. The pictures are kind of blurry because of all the sheet rock dust in the air. And this is a picture of the closet we added. And the last 2 pictures are of Trevor having some fun in the snow. My dad went to Kansas City last week for a business and came back with a matching shirt and hat for Trevor. I was not sure what Trevor would do with the hat because he sometimes likes to wear them and others he will not have anything to do with it. 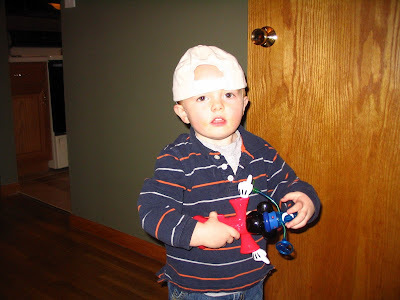 BUT this time it was good he loved the hat and the funny thing is, he likes to wear in backwards all the time!! Trevor: Daddy why does mommy have to go to work? A few minutes later my phone rings and Trevor says: Mommy thank you for the bacon!! This just made me laugh, what a cutie!! Well last night Greg and Kelsi came over to pick-up Greg's new washer and dryer and we made room for our new set that is arriving today. Trevor was sure happy to see them because we had lived with Greg for so long he got used to having him around and then when we moved it was hard but he managed. So last night they made up for lost times!! Well this past weekend Jon ventured West to go hunting and after all that planning and money spent they did not even get 1 coyote so Jennifer do not worry about getting any coyote jerky. So the weekend for the most part was quiet but yet crazy. Friday night Trevor was not feeling good and I could tell he was getting sick because he was cranky and I could see it in his eyes so we just went out to the Syrstad's for pizza and where home early and in bed by 9pm. We did not get much sleep because he developed a bad cold and could not sleep very long because when he would lay down his nose would get stuffed up and it was hard for him to breathe so we spent most of the night sleeping in the chair. Saturday was also pretty uneventful we just sat around the house and watched movies and then Saturday night we were invited in Joel's Hockey game at the Larson Ice Arena in Brookings (he is 6 so it was really cute to watch these little bodies play Hockey). So since Trevor had never been to a Hockey game we went and had a great time. Joel did awesome and even scored a goal!! I like how they rotated the kids every 2 minutes so they all got a chance to play and they played different positions each time. (The pic above is of Joel playing goalie) Then we went to supper with Greg and Kelsi and where back home and in bed by 9pm again. It was also another venturous night because we did not get much sleep. So Sunday was spent laying around and waiting for grandma Diane, grandpa Dennis and great grandma Dottie to stop over and take us out to lunch. They passed through Brookings on their way to the airport to spend 5 days in Arizona where it is warm.....lucky ducks!! Then after Trevor's very long nap grandma Judy and grandpa Dirk came over since they had not seen him in a week they could not go any longer. But this was not the end of the day.....then daddy came home and we were very excited to see him and hear all the stories. AND THEN we were invited to the Pizza Ranch to have supper with my mom's sister Kathy and her family. The pizza was great and we had a good time seeing everyone again. Then it was home to bed. So for it being a quiet weekend it was actually crazy!! Isn't it funny how some days I can not think of a thing to post and then days like today I could write for hours!! So first of all I promised Jon I would post what he had requested. 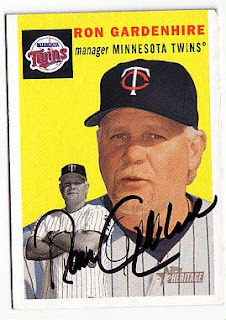 Yesterday when he was at work (still working on building 6 at Daktronics) they had a visit from Ron Gardenhire who is the Manager of the Minnesota Twins along with 2 players and another office person. He was not sure what there names where but that they were there taking a tour. I guess they are on a tour of the surrounding cities (Brookings, Marshall, SF, etc) and they made a stop at Daktronics. Jon really wanted me to post this for Grandma Mydland because he knows how much she likes the Twins!! Second of all my post for today was going to be about Jon and his hunting trip that he is taking this weekend. He is traveling to Chamberlain with the Rost boys for the weekend and they are going coyote hunting (seriously who goes coyote hunting) it just cracks me up to listen to them talk to each other on the phone. They act like they are dating and are planning this big grand trip. So Jeremy was at our house this morning at 9:30am and they were heading out to pick up Corey. Then of course they were going to stop at Cabela's (in Mitchell, SD) since it is on the way. I sure hope they have fun freezing their butts off! My brother just called me to let me know that he has been cleared for graduation this May. He was not sure because there were a few classes he was up in the air about whether he had to take or not but it has been all worked out. 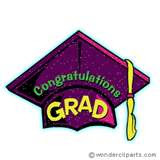 This semester he will only have to take 18 credits as opposed to 21 so mark your calendar for May 3rd....it's graduation time!! He will graduate with a 4 year degree in Construction Management. Congratulations Greg we are proud of you!! Thanks to my great sister-in-law we are getting a new washer and dryer!!! 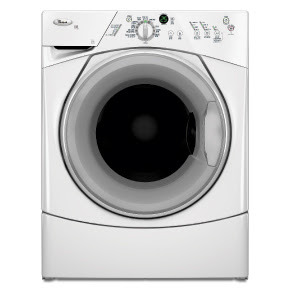 Since we are finishing our laundry room we thought it was time to update also so last night I ordered a new front load washer and dryer and it will be here next Wednesday and I can not wait! Jennifer gets a great discount through work and she let us take advantage of it, we saved over half the money that we would of spent if we would of bought from Lowe's or anywhere else. My brother bought our old set since his blew up and so it is a win win situation for all. Jennifer, thanks again Jon and I can not thank you enough. Well bath time has taken a 365 degree turn at our house. When Trevor was little he liked to take a bath or more or less hear the water run and then when the tub was full it was time to get out. Then he got to the stage where he did not want to take a bath at all he would say "mom, I do not want too". Now however he LOVES taking a bath he will be in there for hours if you let him (Diane I know you know this because when you watched him at our house he was in there forever you said). So last night he would not get out, he played for at least an hour and then he wanted to drain the water but still would not get out, what a nut!! Well this weekend we decided to do something fun so we headed to Great Bear Mountain in Sioux Falls. A bunch of us decided to go and we had a blast!! Jon, Trevor and I went along with Greg, Kelsi, Mom, Dad, Brett, Amy and their 3 kids. We spent most of the day there and we were all completely wiped and cranky when we left. I have personally never been tubing before and it was a really good time. They had 4 different hills to go down and they varied from really easy and fun to very scary and I am happy to report that Jon and I went down all 4 hills and Trevor and Mom just stuck to the first 2. I was not sure what Trevor would think but he was in heaven. You sat in your tube while a rope pulled you up the hill and then you would slide on your tube the whole way down and over and over again so overall there was not a lot of work involved except we had so many clothes on it was hard to walk at least for me anyway! Here are some pictures, enjoy!! Isn't it funny how fast kids change. I just look at Trevor and notice how grown up he has become and how good he gets with his please and thank yous. But there is one thing he is getting worse at and that is getting up in the morning. I had 2 weeks off over Christmas so he got used to sleeping in until he wakes up around 8:30am -9am. And then when it was time for me to head back to work since school is not in session yet my schedule is pretty slack and I do not have to go in at any certain time. So me being the nice mom I am, I get up and get ready and continue to let Trevor sleep in but I have noticed that one thing has surely changed. When he gets up for the day he knows we get dressed right away and head out to the living room where he sits in the chair with his pillow and all this blankets and watches TV and lately it has been Chicken Little. This is where the problem starts he will lay there and just veg out and I can not get him to go when it is time to leave and some morning he will even fall asleep again in the chair. If it is dark out then it is not time to get up according to Trevor. Take for example this morning, he asked if he could wear his PJ's to daycare and I was alright with that as long as we put clean ones on. So he got in the chair and would not move when it was time to go and his response was "mom I am tired I stay home today" I can just see him using this excuse when he starts school!! Hopefully things will change once I get back into my normal routine which is Tuesday next week. We will see what happens! Well it dawned on my last night that the post right before Christmas I said that we got new wheels and that I would share pictures later and I completely forgot. So here is a picture of our new Dodge Durango. We love it!! It has the 3rd row seats and the thing I love about it is that when we do not want to use them we just have to found them down and they are out of the way. With our Tahoe we had to take them out if we did not want to use them and they were really heavy so it was hard for me to do. The other thing we really like is that going down the interstate it is really quiet compared to all the other vehicles we have had and it rides REALLY nice, I still can not believe how soft it rides. Most of you are probably thinking well yeah it's nice but what are you paying for gas BUT actually it is not that bad and it is way better then our Tahoe was, right now we are getting 15mph-17mph which I think is good for an SUV. The point is that we are very happy with it and will never go back to anything smaller!! Jon and I do not watch a lot of movies but it is always nice to do in the winter time. Since we have been working so hard on our house we decided that last night we would just relax. So what better to do then watch a movie. The movie that we watched was called The Ultimate Gift and it is the best movie I have ever seen!!! On a scale of 1 to 10 it was a perfect 10, Jon even agreed with me!! If you are a person who does not watch a lot of movies take some time to watch this one because it will be worth it. Has anyone see it?? Well not much of an update to report today. Jon is still working on the laundry room and yet we have dug ourselves another hole deeper. Meaning we have changed our minds on where are washing machine and dryer will go so back to rerouting pipes and dryer vents again. With moving the washing machine and dryer it will create lots more space for cabinets and counter tops and will also make our laundry room look lots bigger. Now I am even more excited to see the finished project but I think it will be awhile because we have not even started putting up walls. At least Jon knows what he is doing and we do not have to pay someone to change things again. Well this weekend was a successful one. We started another project at the Healy home, we are going to make over our laundry room. Before we did anything we had to replace all the water pipes because they are copper pipes and that can lead to bad things according to Jon so he took all of them out and replaced them with plastic piping. Jon just amazing at what he can do, so far there is not one thing we have ever had to hire to get done he just goes for it. Then to our surprise on Saturday we got our first over night visitors Brett Behnke and his friend Amy. We got a babysitter to come over and watch Trevor that evening so we could head down town for supper and drinks. We really had a great time with them!! They headed home Sunday around noon and the laundry project started once again. By last night all the piping was done so tonight Jon is going to start framing walls. How exciting!! I could go on but would not want to bore anyone. My point is that I got all these cute decorations for next year at 75% off !! Well today was not last day of vacation....sad! But the upside is that I will work tomorrow and then have the weekend off. Today Trevor and I spent most of the day playing trucks, cleaning house and of course hide and seek. He did find a really good spot to hide, take a look! PS....this is already my 200th post!! Well here are the pictures of our finished basement. The whole project started on Friday with all the painting and then Saturday we went to Sioux Falls to pick up new light fixtures, outlets, curtains and everything to finish up. When we got home Jon put the new trim up and Sunday we moved the furniture in. Dennis and Diane I know you will be wondering what we decided to do with the furniture since Sunday most of the afternoon was spent moving things around and non of them worked. To fill everyone in we had a sectional couch and it would not fit right no matter where we put it or what we did. So after everyone left I played around with things and came up with this....I took the corner piece out of the couch and made one extra long couch instead. Since Jon had to work on Monday everything went on hold and then yesterday we hooked the surround sound up and hung some pictures. We both can not believe how well things turned out! Just last week that was the last place we wanted to be and now it is the first place we go. Let me know what you think! Thanks for visiting Healy Happenings and come back soon! 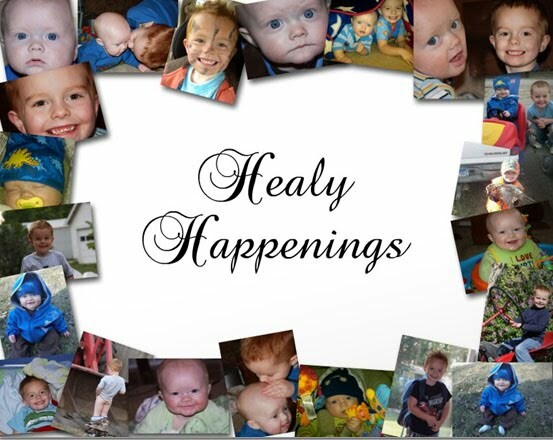 Welcome to Healy Happenings! I am Amber! I am married to my best friend Jon and we have a red headed spit fire son named Trevor and a baby boy named Carter. My boys are my life and I can not image life witout them. My blog is about our everyday life and all the great moments that we want to share with family and friends. Enjoy!